When you’ve spent all day outside in the heat, the last thing you want is to come home to an inferno. 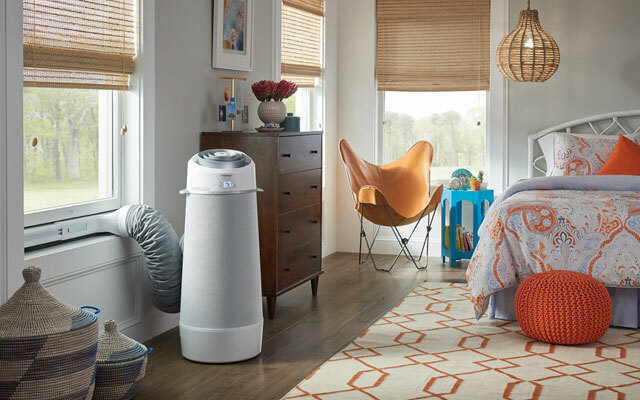 Portable room air conditioners that don’t require installation in a window or through a wall can be a great way to keep cool in sweltering temperatures when central air conditioning isn’t an option. They’re helpful for apartment dwellers whose building regulations prohibit window units and for homeowners who need to cool a room for just a couple of weeks each year. Like window units, portable air conditioners are heavy, typically between 50 and 90 pounds. Casters make it easier to roll them from one space to another. They do need to ventilate through a window, although the air hose is much smaller than a whole unit that sits in your window. To choose the right portable air conditioner, take into account the size of the room you want to cool, the output and efficiency of the unit and advanced any features and conveniences you'd like to have such as a remote control, dehumidifier or sleep mode. · Reduce the BTUs needed by 10 percent if the room is heavily shaded. · Increase the BTUs needed by 10 percent if the room is very sunny. · Add 600 BTUs per person if more than two people regularly occupy a room. · Add 4,000 BTUs if the unit is used in the kitchen. Matching the size of the portable air conditioner to the space you’re cooling is trickier than just buying the biggest, most powerful unit you can afford. An oversized air conditioner will cool a room before it can remove the humidity from the air. The result is a room that feels cool, damp and clammy. To ensure you’re using a properly sized unit, measure your space and purchase a unit designed to cool your room’s square footage. Portable air conditioners average between $300 and $700. Beyond the basic models, you’ll find timers and three-speed fans. 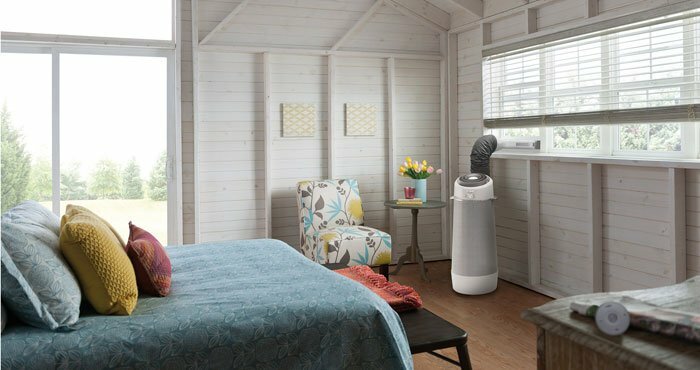 If you’re prepared to stretch your budget, you’ll find models you can control with your smartphone while you’re on the go, units with HEPA filters that can purify a room during hay fever season and units that work both indoors and out. Now that you know what to look for, here are our four picks for portable air conditioners to help you conquer the summer heat. 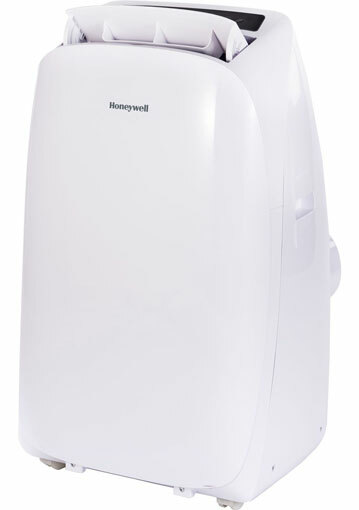 With 12,000 BTUs, the Honeywell HL12CESWW HL Series checks all of our boxes for a portable air conditioner. The remote-controlled unit has three fan speeds, a dehumidifying function, a 24-hour shutoff timer and a sleep mode. If white noise is your thing, there’s a fan-only mode to circulate the air. Set the temperature anywhere between 60°F to 90°F on the unit using the LED display and soft-key controls or the remote control. The unit's built-in dehumidifier removes up to 86 pints per day without a bucket you'll have to drain. Instead, the air conditioner uses an auto-evaporation system to remove excess moisture. Use Dehumidifier Mode when you just need to remove moisture; at those times, connect a drain tube to collect water. The Frigidaire Gallery Cool Connect Smart Portable Air Conditioner doesn’t look like your average portable air conditioner. It’s designed with curved edges and a modern twist so that it looks more like a tower fan than a boxy air conditioner unit. The two-toned cylinder comes in white with silver accents. Adding to its modern design is the ability to control the unit over Wi-Fi using your mobile phone. You can turn the unit on or off, change the temperature, adjust control modes and change the fan speeds using the accompanying Frigidaire Smart App. The app also provides product alerts such as a clean filter reminder and other notifications. You can also control the unit using Amazon Alexa and Google Assistant. The on-device controls include a built-in LED display and buttons to access features such as filter change notifications. The disk-shaped remote control can be magnetically connected to the unit, so you'll never lose the remote again. To ensure it does the job with maximum efficiency, the Gallery Cool Connect's fan blades are located at the top of the unit. Air flows in a continuous, upward spiral. Choose from three fan speeds and five modes: an energy-saver mode, an auto mode, an Eco mode, a fan-only mode and a sleep mode. You'll appreciate the 24-hour timer that lets you program the unit to run the AC during the day, night, week or weekends. If you need maximum cooling power, stat, the Whynter ARC-14S delivers. Its dual-hose design cools rooms as much as 40 percent faster than regular units with a single hose. It’s also a powerful dehumidifier capable of removing up to 101 pints of water from the air per day. Its auto drain function doesn’t require a drip tank, exhausting excess moisture automatically in most environments A carbon filter removes air impurities and odors. You can set the temperature between 61 and 89 degrees and choose from three fan speeds or a fan-only mode. It has a 24-hour programmable timer and will restart automatically after a power outage. Access all of the functions on its LED digital display or using the accompanying remote control. 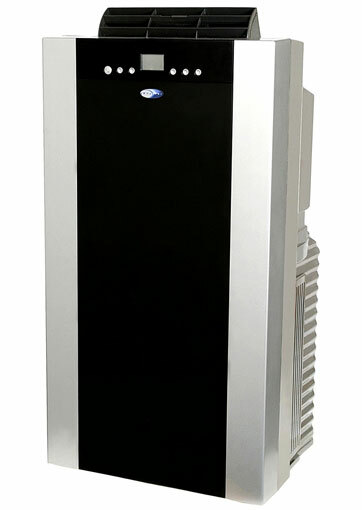 If you live in a dry climate and are looking for some outdoor cooling relief, you’ll want an evaporative cooler. While not true air conditioners, evaporative coolers can lower the temperature in a room by about 5 degrees. They are most effective during the hottest times of day and when the humidity levels are below 50 percent. 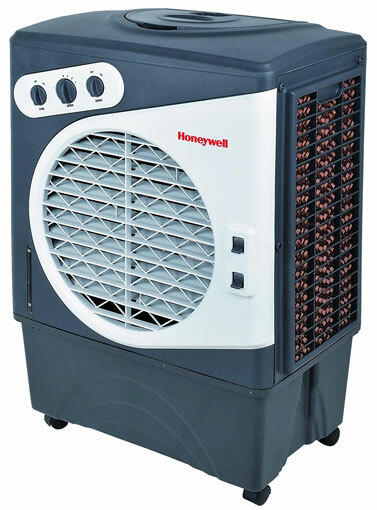 Our pick, the Honeywell CO60PM Indoor/Outdoor Portable Evaporative Air Cooler, can cool a room up to 850 square feet and works both indoors and outdoors. When used outdoors, it has an air-throw up to 12 yards. To help things cool down even faster, the unit has an ice compartment that allows the cold air radiating from the ice to blow out from the fan. Controls are limited to mechanical knobs on the unit to adjust its three fan speeds. It lacks a programmable timer or sleep mode.